There was racing at the Palo Seco Track Meet, but first… It was Martha and the Vandellas who sang about, “Dancin’ in the Street” – it happens for real in Port of Spain, Trinidad & Tobago. Outside the Coco Lounge the guys go into clinches with their girls on the pavement, one even has his black beauty do a couple of twirls. “I did OK there, man?” he asks me as he looks up to where I’m leaning over the balcony. Pete takes it further, he goes down to dance with one of the TV’s who are cruising the strip. I’m happy to watch the guys out freezin’ their elbows in all manner of vehicles from beat up 70’s Toyotas to gleaming white pick ups with LCD displays glowing behind the hubs of gleaming over size wheels – Pete want’s one. This is my favourite time in Trini, it’s warm, the motors cruise, the music pumps, the beer is cool and there’s just no stress. Trouble is, it’s 03:00 before you know it. 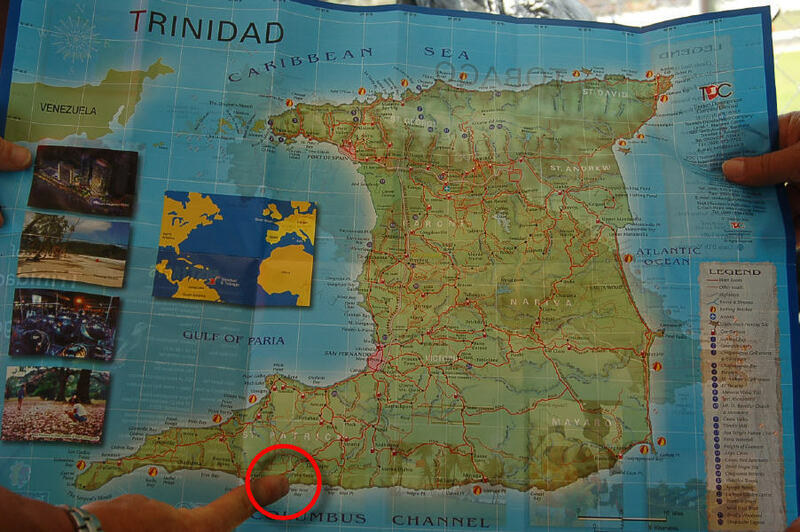 We’re headed way down south today, past San Fernando and the Arima velodrome; the Hindu funeral pyres beside the sea; the ‘nodding donkey’ oil pumps which maintain Trini’s position as the wealthiest nation in the Caribbean, almost to the Columbus Channel which separates Trinidad from Venezuela – to Palo Seco. The roads are narrow, twisting, bumpy and Arnold has to hustle the Maxi Taxi to get us down on time for the start at 13:00. We arrive late, but no one is counting. Not everyone pays to watch the racing. “Palo Seco” means dry stick – very appropriate given the tinder dry state of just about everything. With the first race starting at 14:00, it’s even hotter than usual – the breeze is our saviour. 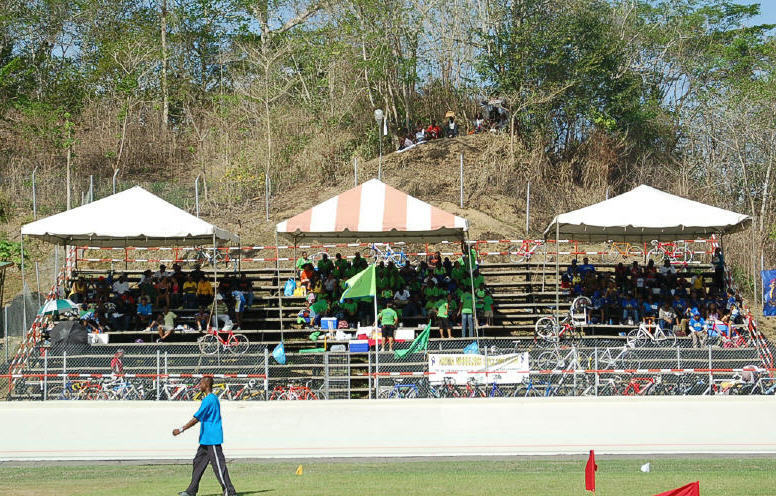 This event isn’t part of the Beacon series of events – it’s actually the annual sports festival for this area of Trinidad. Like a Scottish Highland Games but without the dancers, cabers, bookies and beer tent – although you can get ice cold Carib. There’s an athletics track marked out inside the cycling track, there’s no problem with fitting it in; the concrete bowl is 500 metres around – that’s a big lap. The track is well maintained but a tad ‘lumpy bumpy’ and Pete says the bankings are too steep for the radius, making it very hard to stay upright on the them at low speed. But there’s a photo finish – just a pity that Chiappa and Sellier aren’t riding, here. As the cyclists change into racing gear, over on the grass the javelins fly as the drums pound those voodoo rhythms. The sprinters do their thing. 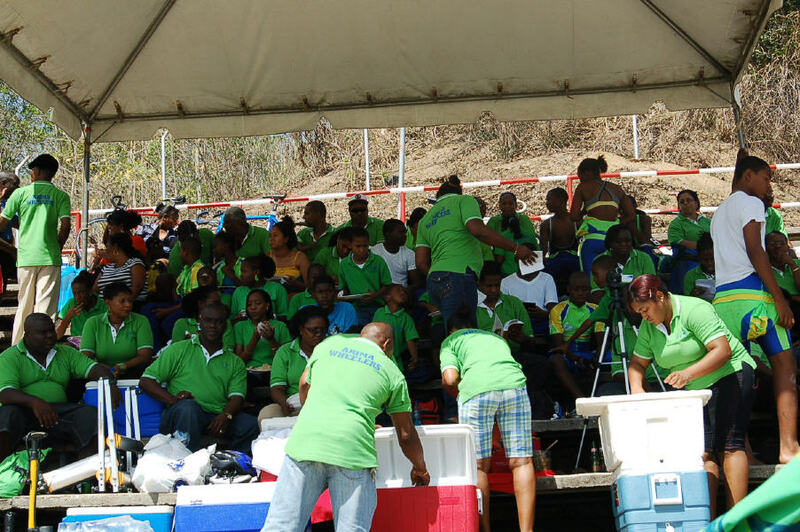 The runners run, the Arima Wheelers fan club gathers in the stand and to sit out in that sun would be unimaginable. Homeboy, Elijah Green takes the first heat of the 500 metres easily, meanwhile, the Euro guys debate the merits of the track. 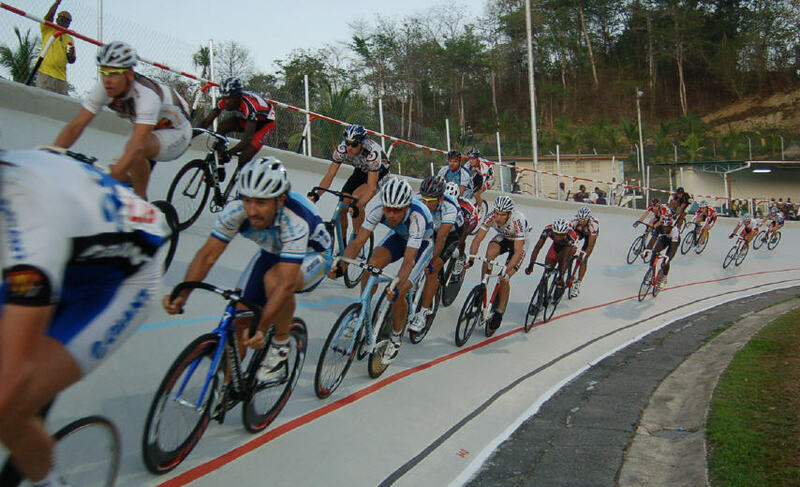 For most of them, it’s their first time on the super steep track; albeit an hour’s training time was allocated before the Games started – but we were late. Canada’s Stefan Cossette took the two lapper – he’s quick but tends to go to sleep in a match situation. A local hero is Hasley Crawford, 100 metres sprint gold medalist at the 1976 Montreal Olympics. “This track is special for me; at the start of my career I missed qualification for the Caribbean Games, but at a meeting on this track I beat all the guys who qualified and that got me my first international selection. The track was different then, there was a big bamboo grove above the cycle track banking, back then – and you used to aim yourself at it! When I won my Olympic gold, I based myself in Crystal Palace, London – I raced all over the world, but London was my base. My best time officially was right on 10 seconds, but I was 9.8 wind assisted; my best on grass was 10.4. We have some good sprinters coming through – I think our runners will be good for London 2012. Jim Clark, one of his rivals from the old days squeezes past; ‘did you used to beat this guy?‘ I enquire of Jim. ‘All the time, man!‘ laughter all round. Dave Wiswell and Gideon Massie. Franco does his usual ‘long way out thing’ in the 3000 metres, but one and a half laps on this track is a long way; one of the Canadians sits in and comes by on the line. Franco loses the devil to Walter. The Devil goes Perez’s way – his loyal Argentinian lead out men see to that. 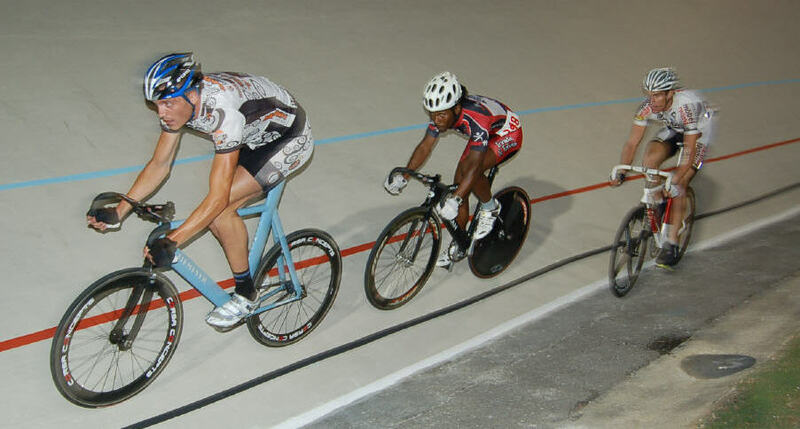 The sprint final goes to Giddeon Massie from Home Boy Green by way of some nice match sprinting. The last event is the big one – 30 laps under the flood lights, the air is cooler but still warm; the wind has died as the bunch rolls. The band get a telling off, play louder! The drums kick in and Franco and Dan Harm bolt with two locals, Martin Ferrari bridges and the five get down to it, their bikes snaking and squirming on the steep, uneven concrete. Franco rides a lap at maybe 95% and one of the locals is blown, so is Ferrari. Then the other local cracks, Harm is struggling but Franco waits; it’s too far to go alone. Behind, the chasers can’t get it together, not helped by gasping riders rolling off the track, wasted. Seb Donadio, Walter Perez and T & T road champion Adam Alexander get it together briefly but still Franco and Harm plough on. Two to go, Harm attacks – that ain’t gonna work. Franco closes him down, the bell rings, the Swiss climbs high on the banking, swoops and is gone – he wins by the length of the straight. Franco follows the old adage, that ‘you race to your own standards, not the others’. Marvulli doesn’t have to ride like that, but he’s a pro with five world titles to live up to. Dan Harm tells us Franco is the man. And that’s it – time for us to drive back to Port of Spain, pack the bags and catch the plane at 07:45 tomorrow. And it’s goodbye from Peter.